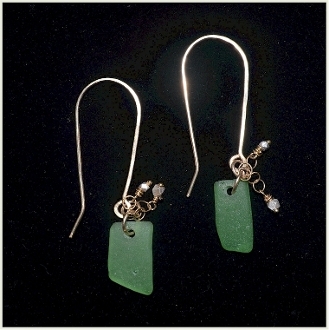 Kelly Green Key West Sea Glass earings. With silver Fish Hook closures from the the Karen Hill Tribe. What makes Karen hill tribe silver so special? Being between 99.5% and 99.9% pure silver, Karen silver has a higher silver content than Sterling silver. It's just the solder used to fuse the silver components together that makes up the last fractions of a percent. Consequently, it has a weight, bright satin colour, and feel, all of its own.